While other carriers gear up for the upcoming iPhone 5, T-Mobile today introduced a trifecta of 4G products poised to take advantage of the carrier’s 20 Mbps-plus network speeds. Two smartphones, the Android Gingerbread-running HTC Amaze 4G and the Samsung Galaxy S II, along with a hotspot, the Sonic 4G Mobile HotSpot, were introduced at the Mobilize 2011 conference. The HTC Amaze 4G is all about the camera. It has 8 megapixels, 1080p HD video recording capabilities, a backside illuminated sensor and a dual LED flash. Touting zero shutter lag, it also comes with some proprietary digital camera features like SmartShot, which takes five photos and creates a composite for the “best” shot and PerfectPics, which creates a separate album of best photos based on qualities such as general picture sharpness and the presence of faces. 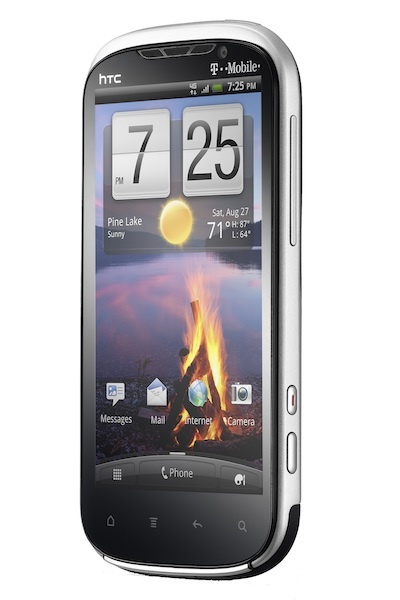 And we know all about the Samsung Galaxy S II, but the T-Mobile flavor is slightly different than Sprint’s Epic 4G Touch version. T-Mobile’s Galaxy S II will be NFC enabled, with a 1.5 GHz dual core Snapdragon processor. The 4.52-inch display, HDMI out and most other features remain largely unchanged. T-Mobile’s Sonic 4G Mobile HotSpot, built by Huawei, can support up to five Wi-Fi devices and is small, weighing in at only 3.88 ounces. It has an SD card slot so you can share photo and video content with anyone who is also connected to the hotspot. An OLED screen on the device displays stats like network strength and battery level. T-Mobile could soon be the only carrier not to offer Apple’s iPhone, so the company has instead decided to boost its 4G and Android offerings. It’s a smart move, as Android is iOS’s biggest competitor for now. In March, AT&T announced intentions to buy T-Mobile and merge their networks into one conglomerate. The move was recently blocked by the Justice Department, much to the joy of competing carriers (and many T-Mobile subscribers). As the “anti-iPhone” carrier, it could also be smart of T-Mobile to embrace Windows Phone 7 and its upcoming Mango update. With Nokia’s hardware and software teams firmly behind Microsoft and a slew of new devices in the works, the critically acclaimed fledgling OS could take off come 2012. But so far it seems that AT&T has embraced that role a bit more, offering three Mango-specific smartphones that will debut this fall. The HTC Amaze 4G will be available starting Oct. 10 and will cost $260 with a two-year contract. The Galaxy S II will run you $230 when it lands Oct. 12. The Sonic 4G Mobile HotSpot hasn’t been officially priced yet, but it will also be available in October.